Visions of Jesus Christ.com - Francesco Forgione - Stigmatist. Photos are of Francesco Forgione/Saint Pio. Below is a brief biography of St. Pio. Read/view a full write up [here]. Francesco Forgione was born to Mamma Peppa and Grazio Forgione in the little town called Pietrelcina, in Southern Italy, during the month of flowers, May 25th 1887. He was fifth of eight children. His Mamma Peppa confided he was different from other boys: “he was never impolite or misbehaved”. He had celestial visions and diabolical oppressions from the age of five years and he saw and spoke with Jesus and Our Lady and with his Guardian Angel, but unfortunately this heavenly life was interwoven with hell and with the devil. In 1903, Discipline and ill health had been woven together to crown the youth of Pio. Doctors diagnosed him as consumptive and were sure he would die. 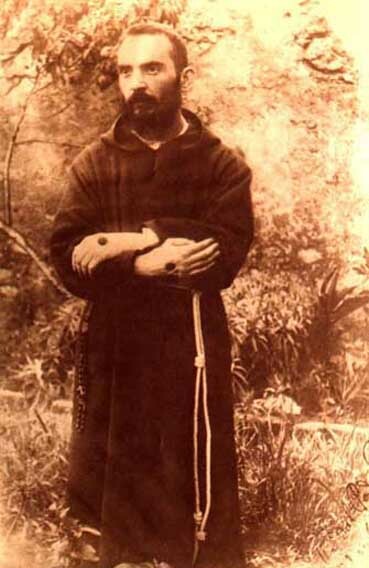 Strong in spirit Pio received the Capuchin Franciscan cloths initialling religious life and therefore; Noviciate with its intense study, prayer, austerity, penance and finally vows of Poverty, Chastity and Obedience. In 1909, we find him at Pietrelcina because of his illness, at his mother’s side. Now another intense chapter of extraordinary life opens with mystical afflictions an invisible stigmata and terrible battles with devils that wanted to destroy him began. Yet, “It all happened here”, he said, his whole future was prepared here. On August 10, 1910, he was ordained a Priest in the Cathedral of Benevento. In 1916, we find him in the church of San Giovanni Rotondo, soon to become his Jerusalem, with the mystical and historical calvary of Gargano, where he was soon recognised as the “saintly friar” by the locals. Here he became a “victim of love”, by the reparation for sin, propitiator and regenerator of the many crowds who flocked to him, to venerate his bleeding wounds of his hands and feet. 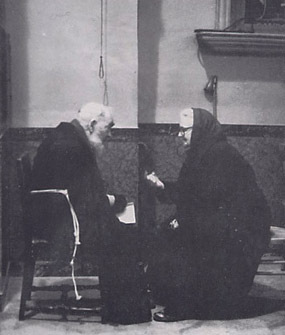 This very important event occurred in Father Pio’s life on September 20, 1918, while he was praying in front of a Crucifix located in the choir in the little old church, when a strange personage like an angel, gave him the stigmata. Those stigmata have been remained opened and bleeding for fifty years. This was one of the reasons for which doctors, scientists, journalists and common people have gone to San Giovanni Rotondo for years, in order to meet the “Saintly friar “. He usually woke up in the early morning in order to get himself ready for the Holy Mass. In fact, every morning, at 4 a.m. there were always hundreds and sometimes even a thousand people waiting for the door of the church to open. After the Mass he used to spend most time of his day in prayer and confessions. After fifty years of stigmata he died September 23, 1968, thus he closed his mission of the Heart’s desire, with the real cross and the real crucifixion of his body. 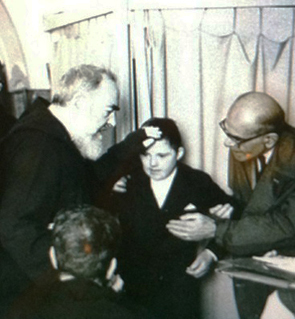 In September 1968, thousands of devotees and Padre Pio’s spiritual children were assembled in conference at St. Giovanni Rotondo to commemorate together the 50 anniversary of the stigmata and to celebrate the fourth international conference of the Prayer Groups. Nobody would have imagined that at 2:30 a.m., September 23, 1968 we the earthly life of Father Pio of Pietrelcina would end. Learn more about these events [here] and [here].